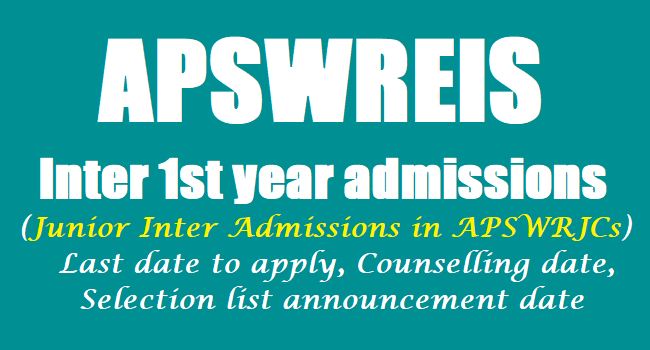 APSwreis Inter 1st year admissions 2019 notification, Apply Online till March 26: APSwreis Junior Inter Admissions, APSWR Junior Colleges Admissions, APSWRJCs Junior Inter Admissions, Last date to apply for AP Social Welfare Inter 1st year admissions, Download Junior Inter admissions application form, Eligibility criteria, Selection list (Results) Announcement date, Counselling date and other details given here. APSWREIS.Info Notification for admissions in junior intermediate of apsw residential institutions for the academic year 2019-2020: Andhra Pradesh Social Welfare Residential Educational Institutions Society(APSWREIS) has given the Intermediate 1st year admissions 2019 notification and applications are invited from the SSC passed students in first attempt in March 2019 for admission into 1st year intermediate in 163 apswr Junior Colleges for the academic year 2019-2020. (b) The students should apply within his/her own district. can apply in other district of the same Zone. f) A copy of marks memo of SSC obtained through E-SEVA / MEE-SEVA is to be enclosed to the application. g) The students should produce Caste and Income certificates certified by M.R.O. The age of the student shall not exceed 17 years as on 31.08.2019. In case of the students studied in APSWR Schools and S.W. Hostels relaxation of 1 year will be given to. 1. Out of 87% [75% for SCs and 12% SC converted Christians], 75% of seats are reserved for the students who have studied in APSWR Institutions and SW Hostels, remaining 25% seats will be given to open competition among SC students including SC converted Christians, viz., those who studied in any other recognized institutions. 2. For 13% Quota meant for ST(6%), BC(5%) and OC(2%) seats are reserved only to the students studied in APSWR institutions and SWR Hostels. In the circumstances, the seats are not filled with APSWR Institutions/SW Hostels, the seats will be filled with BC,ST,OC students, who have studied in any other recognized institutions as per the merit. 4. 3% overall seats will be reserved under sports quota, . vii] Women Sports Festival viii] State/District /Tribal Sports/CM Cup 5. 3% of the seats are to be earmarked for orphans/destitutes in the age which is appropriate to class applied in Residential Schools / Residential Jr. Colleges run by welfare departments and Education department as per G.O.Ms.No.47, Dated 31.08.2010 of women & Child welfare Department. 5. If no sufficient applications are received from outsiders, the vacancies will be filled in by students of APSWREIS and SW Hostel students. The candidates can obtain application form duly downloading from the website www.apswreis.in. OR The candidates can also obtain the application from any nearby APSWR institution. The Principals will issue applications free of cost to all the students. The list of 163 APSWR Junior Colleges with groups, sanctioned seats for the academic year 2019-19 is enclosed herewith as Annexure-B. for applying to the Junior Colleges. The list of counseling centers is enclosed herewith as Annexure-C.
1. Last date: The Last Date for receipt of applications is 05.04.2019 upto 5.00 pm. Applications received after 5.00 PM will not be accepted under any circumstances. 3. Announcement of Selection List: The list of selected students along with the waiting list, will be displayed on the Notice Board on ......05.2019 at 10:30 A.M.